Periodically in life, there are situations (e.g., moving), in which the ability to disassemble and reassemble the furniture will help to save not only money, but also your back well. Competently disassembled the Cabinet takes up little space, easy to transport and possible re-build, retaining its appearance. Pliers, flat screwdriver, Phillips screwdriver, auxiliary tank. Remove those shelves that are installed on shelf brackets. 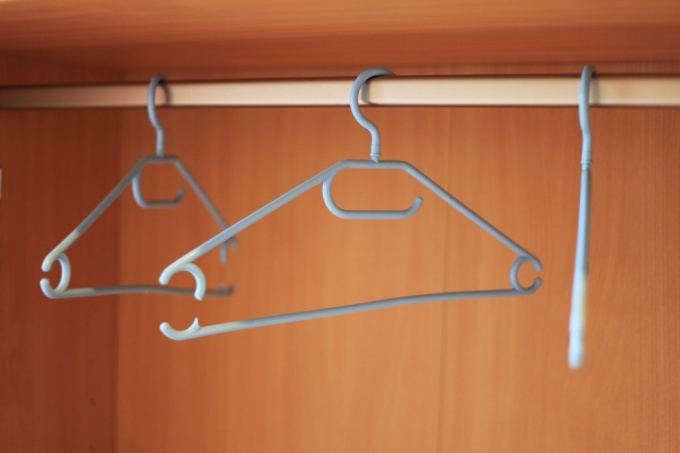 If the design of the wardrobeand provides a crossbar, off. Then remove all the shelves that are bolted to the body of the wardrobe. Then remove the door. For this you need to Unscrew from the body of the Cabinetand the screws holding the door hinges. To remove the unit, if equipped. It is necessary to find a mounting location mezzanine to the main body Cabinetand remove the fasteners (bolts, screws, Cams). Then, holding the unit up (better to do it together), to separate it from the body of the wardrobe. Ideally, after these manipulations you should get an empty rectangular box housing with a back wall made of plywood or fiberboard. Then, you must free enough space to be able to put the rack horizontally on the floor so that its rear wall was on top. To see how attached the back wall. She or screwed with screws (in this case, they would have to spin), or nailed with nails or staples. Nails and staples are removed with a narrow chisel or screwdriver podawa them to the plywood edge, which is the rear wall. Wall usually separated with staples or nails, which should then be removed. If this has not happened, and a fastener passing through the plywood remained in the body of the wardrobebut it must also be removed. To step inside the resulting rectangular box, consisting of wall wardrobe. Realizing how interconnected wall Cabinet (screws, corners, or eccentric) for further disassembly necessary to remove the fasteners so that the opportunity arose to rent one of the short walls of the rectangular box. Then in the same way removed long wall in the last turn razminutsya the two remaining walls. To remove all the parts of the fasteners remaining in the body. This is very important, depends on the preservation of the wardrobeand transportation. With doors, you must remove the handles, magnets, Unscrew and remove the hinges. If the parts were fastened the eccentric, remove the screws the eccentrics of the holes to remove the plastic or wooden dowel, shelf support, remove the hooks of the hangers, the coin bars, the legs are wardrobe. After dismantling should be a flat part and a separate container with fasteners. This will facilitate the storage and transport Cabinet. Before starting work, it is necessary to prepare a container in which to put removed from the Cabinet fasteners. For ease of reassembly, all the parts of the Cabinet, it is desirable to label, such as a pencil to make labels like "top", "bottom", "left door" and so on. Often due to different life situations, for example, repair or relocation becomes necessary to disassemble and reassemble the furniture. It would seem, nothing complicated, however, when it comes to modern technologies used today in the manufacture of furniture, many even skilled repairmen and craftsmen just come to a standstill. This also applies to disassembly of wardrobes. 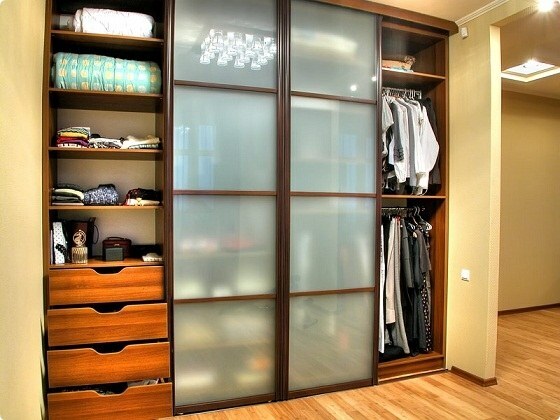 Go to your wardrobe and inspect the fastening of the doors. Take a screwdriver, stand on a chair and Unscrew the bolts on special retainers, which are available on both sides for one and the second door. Remove the stoppers so they are not in any way interfere with removal of doors. Please note that in some cases it stops prevent removal of the door and not allowed the mechanism to go off the rails. Close the Cabinet door, lift the door a little bit from one corner and otprint with a screwdriver the roller at the bottom of the structure. The roller should be removed from the groove. Gently lift the door up and post it at the bottom of yourself, pulling yourself. Remove first the bottom, then sprinted to the door to the floor and remove the top. Perform these steps for the other door and later, if your wardrobe contains two, three or more doors. Remove the doors from the wardrobe necessary one by one. In any case, do not try to remove all at once or pull door without removing the special corkscrews, you risk damaging the mechanism. In cheap models the rollers are only used guides located at the top and bottom of the frame of the Cabinet, so removing the door just Unscrew the side bumpers and roll out the door from the slots of the guides. In the premium-class models are set closers of doors, therefore, before dismantling it is necessary to remove them. In order not to compromise the integrity of the design and not waste time on adjustment after Assembly, loosen the latch only door leaf. The mount on the box don't touch. Besides all this, be careful, removing the doors from the wardrobe. Everything should be done gently without force, as excessive pressure can damage the mirrors available at the door or the wood from which the Cabinet is made. After you Unscrew the stoppers, put the screwdriver away, you should not keep it in hand, or, as they like some, in the teeth. It is dangerous for your health and for doors that can accidentally damage a sharp object. Very often in connection with the rearrangement in the room, buying furniture or moving to a new place there is a need to move it. Out of the apartment wardrobe-coupe assembled practically impossible due to its large size. To disassemble it is not difficult, but to think about the subsequent assemblage to advance. Approach this process responsibly. Door you need to gently pull out. To do this, slightly lift them and remove from the guides, first bottom and then top. As soon as the first door-coupe will be charged, in the same way, clear second. Pull out drawers, pull out shelf mounted on shelf support. In the presence of the crossbars, they should also be removed. Those shelves, which are screwed to the enclosure, using a screwdriver, Unscrew and take out. Unscrew the rails. Do this carefully, as rough and sharp movements they can easily bend. After they are removed, go to the Cabinet case. Examine it and determine the method of attachment of the rear wall. If the wall rests on the screws, they need to turn. If using nails and staples, carefully remove them using a screwdriver or narrow chisel. Alternately Unscrew the top part, sidewalls and rear wall from the base. Screws, nails and staples left in the walls, be sure to remove and fold together, as they will be useful in the further Assembly of the enclosure. The base flip the legs up. Each leg and Unscrew using the screwdriver. Put all the pieces together, so nothing to lose. Now a wardrobe-acompartment disassembled, and it can be easily moved to another location. Special attention should be paid to doors with mirrors. In order not to accidentally break or scratch the mirrors, they are best to cover with a veil, and when transported to put in a box weave or a synthetic winterizer. In order to make it easier to assemble the wardrobe again, all items numbered or sign them with a marker (example: "top", "rear wall"). This will allow not to get lost. All fasteners and small parts are best stored in a separate container.